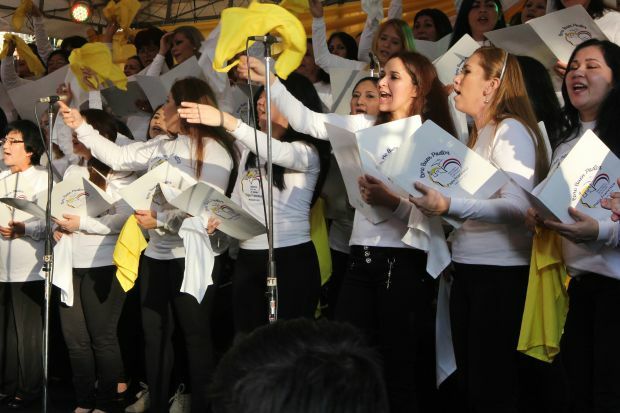 ASUNCION, Paraguay (CNS) — Pope Francis stopped to listen to 50 women prison inmates sing a welcoming song as he traveled from the airport to the papal nuncio’s residence upon arriving in Paraguay July 10. Although brief, the stop outside the Good Shepherd women’s prison, where he blessed the women and received a hand-embroidered stole from them, reinforced the concern for prisoners expressed in Bolivia earlier that day. The event also cheered the women, who had prepared the song with the director of the chorus in the prison, a former convent that now houses about 500 inmates. The pope did not enter the prison, but he stepped down from the popemobile and approached the stage for a few minutes. Father Luis Arias, prison chaplain, called the stop “confirmation of a miracle from God,” because it was not on the pope’s original schedule. Even before Pope Francis arrived, the news that he would pause at the prison had an effect, Father Arias said. Prison life became better organized, and more people volunteered assistance. Like the Palmasola penitentiary in Santa Cruz, Bolivia, Paraguay’s prisons are overcrowded, and about 70 percent of the inmates have not been sentenced, Father Arias said. Celestina Ruiz, 42, one of the two women who presented the pope with an embroidered stole that had been made by other inmates, has been in prison for a year and 10 months without a sentence. “The hardest thing is being separated from my family,” she said. The pope gave a blessing and a kiss on the cheek to Andrea Garcete, who joined Ruiz in presenting the gift. “Receiving the pope’s blessing is like a ray of hope for receiving my freedom,” said Garcia, who is awaiting parole. “I would ask his blessing on all of us and on our families, especially health and strength, because being deprived of freedom is very difficult, not so much for us, but for our families,” said Garcete, who has a 14-year-old son. After the pope left, relatives of some of the inmates crowded around the stage, snapping photographs as the women continued to sing. The Good Shepherd prison, a former convent, is built around a courtyard where all the inmates gathered after the pope’s visit. Father Arias and staff members handed out sandwiches and drinks to the women, some of whom held small children in their arms. The prison has an area called Amanecer, the Spanish word for dawn, where children can live with their mothers until around age 4. Father Arias has seen some changes in the prison in recent years. Besides the creation of Amanecer, prisoners can reduce their sentences by working and studying. And the church and government have joined efforts to set up halfway houses for people released from prison who have nowhere to go. But more improvements are needed in the country’s prison system, where food and medicine are often in short supply, Father Arias said. Brief as the visit was, he believes that Pope Francis’ pause outside Good Shepherd, or Buen Pastor as it is known locally, will raise awareness of the situation in the country’s correction centers. “Many people are going to find out more and will begin to become concerned about their brothers and sisters who are in prison,” he said.